do they like to be handled and cuddled? We've just got back from slobbering over Sydneys ma and pa..lovely beardies. Have just ordered some Dubia Roaches from a place called the Roach Farm..really cheap. 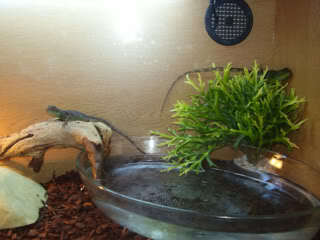 Hate the crickets..horrible things, and I find that both Sydney and Saphira are not really too keen on them. They love Locusts but they are so expensive, so we are having a blast at breeding our own and Dubia's. The Crickets have bred like I don't know what..and they don't like them...typical.